Specimen collection numbers PTM 418 and SCL 15333 in the UBC Herbarium Algae Database. Search the collection numbers in the database for more information on these specimens, or search the species for further occurrences. Images courtesy of Sandra Lindstrom. 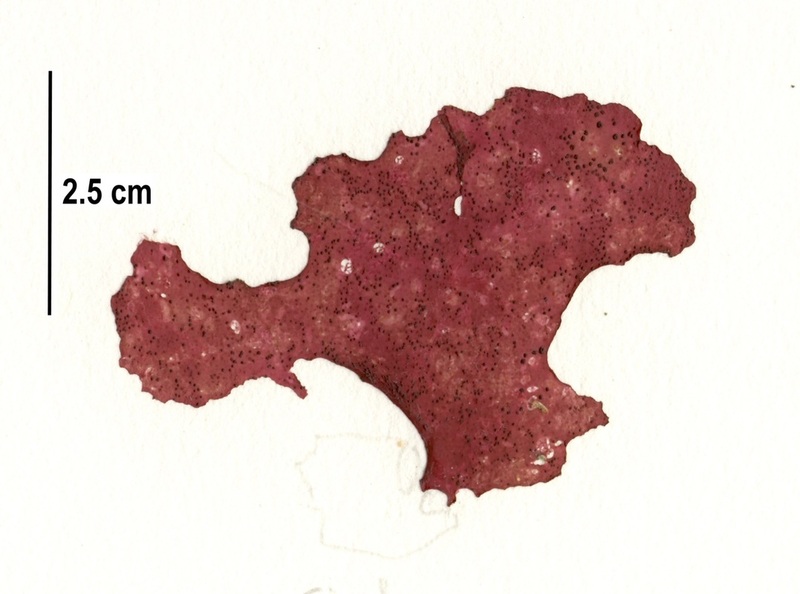 ​The thallus of this red seaweed is relatively thick with a vaguely circular shape and irregular lobes. The tiny holdfast measures only 1 mm wide and is usually attached to the blade directly, though occasionally the blade may be connected via a short stipe. It grows to 18 cm tall, and tends to lay across the substrate instead of growing upwards. This species has been recorded growing on rock in the low intertidal and subtidal; it is also occasionally found growing on marine invertebrates. It has been recorded as Salishia firma at multiple locations along the coast of British Columbia, and one location in California. Before the Salishia genus was defined (and other genera, including Pugetia, were redefined in the same study), it was recorded as Pugetia firma in BC and California, and as the synonym Callophyllis firma from Alaska to California (due to the reevaluation of genera these records may not be of S. firma as it is now defined. Similar species reviewed or redescribed in the same study include Salishia sanguinea and Pugetia species. See Clarkson and Saunders (2012) for details. Clarkston, B.E. and Saunders, G.W. (2012). 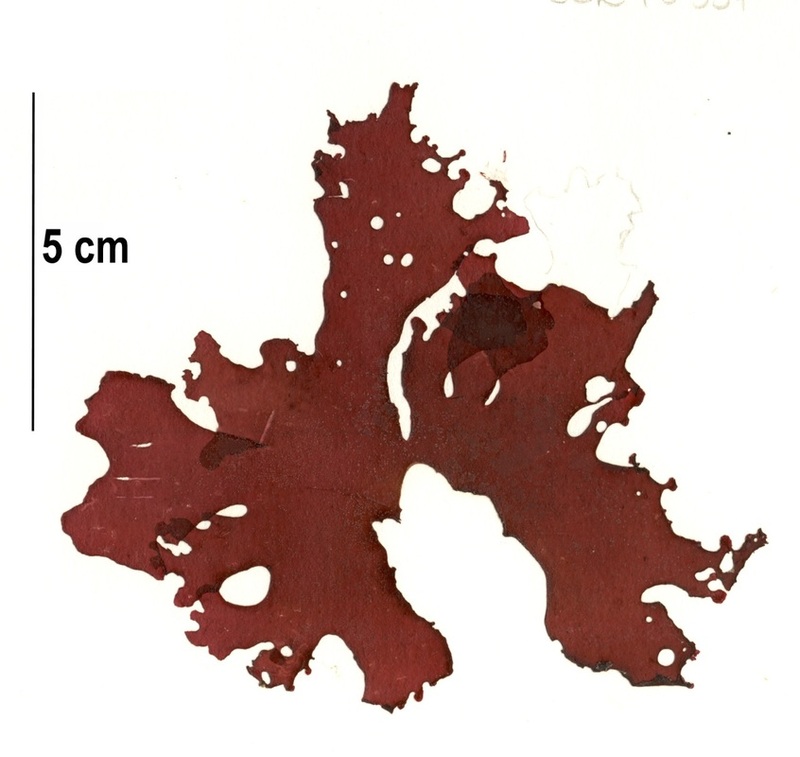 An examination of the red algal genus Pugetia (Kallymeniaceae, Gigartinales) with descriptions of Salishia firma gen. et comb. nov., Pugetia cryptica sp. nov., and Beringia wynnei sp. nov. Phycologia 51(1): 33–61. Guiry, M.D. & Guiry, G.M. (2016). Salishia firma (Kylin) Clarkston & G.W.Saunders. AlgaeBase. National University of Ireland, Galway.